Does the 'Cuddle Hormone' make men more empathetic? And where do such focused solutions end up? " ... "This study is the latest of several that suggest that intranasal oxytocin seems to 'sensitise' people to become more aware of social cues from other individuals - and more likely to be sympathetic to them." .... " . Via the BBC. A WSJ piece about how P&G is luring back customers in tough times. In Gigantico, a series of videos being produced by Chris Grayson on this topic. The link here points to the first video, which specifically talks about augmented reality. A number of useful case-studies, in particular applications of AR in eCommerce. Good examples for those interested in virtual retail. Note the examples of the 'virtual makeover', which despite their approaching realism in recent years, have not yet succeeded in general. We tested everal implementations. Some new examples by Fujitsu and Samsung are shown. The first episode on Youtube, gives background and is also worth seeing. Wired article on the technology inspirations of the 1939 World's Fair. The WP post is also interesting. Was before my time, but I was inspired by the 1964/1965 Fair, which included a database retrieval demonstration by IBM, whose output device was a card-punch. We have come a long way. This year, the Shanghai Expo 2010. Good piece in GigaOm, on the enormous promise of location. Good as an introductory piece to forward. I have been involved in a number of mapping, Geographical and tracking systems in industry over the years. And yes, it is right now when all the stars are aligned and the software is good, mashable and ubiquitous. Add that to that it has all become mobile. This is the time to create some very interesting new things. I have mentioned the concept before, 'checking in' to objects rather than locations. Adage mentions it in a recent post. The Stickybits App is one of the first applications of this for mobile and worth taking a look at. Can change the notion of loyalty to items in the store, rather than location, and from the retailer to the manufacturer. It then moves an aspect of control to the manufacturer. The response of the retailer should be interesting. I agree with some of the commenters, we need to examine the incentive of the shopper to do this for many products. I have mentioned Clario in this space several times and have done some simple tests, they have published a new White paper on Analytics integration, short but useful.
" ... Developing a strategy for integrating analytics into your decision making process is critical to the success of your business. This new whitepaper from Clario® Analytics President Randy Erdhal discusses common hurdles facing companies implementing an analytics strategy, how technological advances have addressed these hurdles, and guidance to facilitate the introduction of analytics into your company ... ' . Download the white paper from here. Also, they have an upcoming webinar on May 5, send them a request for more information. An upcoming conference on using game play for serious ends. In September 2010, Created by Thought Bank LLC. They are looking for sponsors. I have not covered this topic for some time. We visited retailer Beijing Hualian in 2000 to help with the early consulting for the Chinese Retailer's innovation Center. Word is that it will be officially opened this summer. Here are some general details, some inspired by our own innovation centers. Another piece akin to Tufte's view of Powerpoint. My view of Powerpoint has softened over the years, but using it for everything can be mind-numbing. Mark Montgomery of Kyield recommends this post in the blog: Life as a Healthcare CIO. A fairly obvious conclusion based on just cursory observation online, In ECommerce Times: " ... B2B organizations have largely accepted online social media technologies as useful marketing tools, and they're working to adopt the best practices of their B2C peers... "
Lots of good things in the Boot Camp Digital Blog by Krista Neher. Including audience measurement, social media strategies, marketing your business on Facebook, social media tips and tricks and much more. You can get a free introductory consultation. Or join their excellent mailing list from their home page. An Edge Special on how decision makers acted in response to the transportation crisis caused by the Icelandic ash cloud. A very good interpretation by a number of analysts. Implications for decision makers. In past years I have flown over Iceland and seen eruptions from the sea and always wondered about the consequences. In Mind Hacks, a short description and links to new fmri study of religion and the brain. You may recall that Martin Lindstrom also included a set of studies based on his analyses of the biometrics of religious leaders in his book: Buyology: Truth and Lies about Why We Buy, recently re-released in paperback with some additional material. I had the opportunity to talk to Lindstrom about this study. He outlined the particularly interesting and unique aspects of this study and agreed that much more had to be done in this arena. Understanding the universal neural aspects of human spirituality deserves much more work and ultimate understanding. As might be expected for a marketing futurist he is particularly interested in how these learnings might influence product marketing and context. I have mentioned KYield a number of times here. Here an overview of what they are about. I am on their advisory board. Kyield is a semantic enterprise system designed to substantially improve innovation and productivity throughout the organization while reducing human-caused crises. The system is based on a solid systems approach that emerged from over a decade of applied R&D in a pioneering incubator and lab. I see that the new version of Spotfire has increased emphasis on predictive analytics. 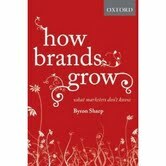 Correspondent Byron Sharp, Professor at the Ehrenberg-Bass Institute, University of South Australia, has a new book: How Brands Grow: What Marketers Don't Know. Here is the book's web site. I have mentioned the Ehrenberg-Bass Institute's work in this blog a number of times. "all marketers need to read this book...or be left hopelessly behind"
To my surprise, in Slashdot, report on the growth of Ham radio. It doesn't require connectivity and in disasters, providing there is a power source, will still work. A look at why complex times need simpler packaging. In the BBC News: UK retailer positions the Tesco as a new unit of measure. The techniques described are not new, but very much worthwhile for anyone hoping to do predictive analytics. I have just been re-introduced to the language with the online book: R in Action, by Robert I. Kabacoff. Excellent introductory book on the topic.
" ... Designer Julia Tsao presented a seemingly outlandish yet provocative idea for a futuristic display at this week’s Emerging Communications conference. The project, called Curious Displays, does away with fixed form factor convention and is instead made up of hundreds of half inch autonomous blocks programmed with swarm intelligence ... "
Doug Lautzenheiser posts about a recent experience he had with up-charges by Delta Airlines. I have now flown out of Cincinnati for thirty-three years. Traveling all over the globe with them or affiliates. After I retired I was immediately downgraded because I did less traveling, after having posted only somewhat less than the million miles required to keep my frequent flyer credentials. Now in the past few years they have begun to systematically charge for any kind of change of itinerary, sometimes absurdly so. Doug provides a good example in his post. Delta ... from here on I will make every effort to not use your services, and will talk this up at every opportunity. Screwing your best thirty year customers is not a sustainable model. Find another. Social networking has taken off in many forms over the past few years. It works in the sense that connections that were difficult in the past can now be made and nurtured. Yet it is inefficient thing, where you have to wade through many other things to get to the items of value. RedWriteWeb points out that networking is beyond just social networks. Worth remembering. 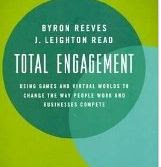 Although published late last year, this book was recently brought to my attention: Total Engagement: Using Games and Virtual Worlds to Change the Way People Work and Businesses Compete by Byron Reeves and J. Leighton. The book's site is here, and there are also a number of book excerpts. The Amazon site also has a 'look inside' link. Serious Games have been a long-time interest of mine. Have been reading Total Engagement for several days now in a borrowed North Georgia mountain cabin. (Thanks Sammy). Think about any job as a game, often a very badly designed game. If it were designed to be engaging, collaborative and very efficient at its goal (say making money or helping people) it could not only do a better job at its goal, but also engage, entertain and make the people working at the 'job' happier. Its funny, but there are many examples of engaging multi-player games that are played by millions of people world-wide. Why not use them for real jobs? There is a real gem of value in this book. I know lots of people that may see any games as non-serious by definition, but it is exactly that assumption that keeps us from solving many problems efficiently. The authors include a number of examples of potential serious games from their interviews with companies, including my former enterprise, which did have a reputation for being less creative in this regard. There are corporate problems that games might solve, as one chapter suggests. It is still not an easy thing to do, but this book outlines how to start. Bravo ... this books lays out the direction for any company to use games as a problem-solving tool. We connected with Byron Reeves at Stanford a number of times and reviewed his Seriosity work, which also has a blog. And is active on Twitter. Some of Byron Reeves ideas were also inspirational for our early online consumer advisory work. Also see the Serious Games Twitter Stream. I will continue to follow up with additional thoughts derived from this book. In StorefrontBacktalk: Visa buys more than a security company for 2 billion. Comments on its being more than just a security company play. See also Cybersource's press release, which positions the purchase as speeding up eCommerce.
" ... Along with my colleagues Jeff Hesse and Terry Holliday, I have been trying to understand what makes some teams of knowledge workers more productive than others. In particular, we have focused on people who work in firms that create lots of value as measured by earnings before interest, taxes and depreciation (EBITDA) per employee. In our work so far, we've discovered the primary difference in how they do work is that they have the power to shape their work environment — which means that they can customize, upgrade, and even create new information technology to propel their productivity ... "
A TDWI / SAS Paper on ensuring clean, consistent data. I have just been involved in a project where this could have saved us much money and time. Read it. A short article in New Scientist. In computing we have precise measures of how much storage exists. In the brain, neither the method of storage nor how much room the brain has is clear. People who learn to recite very long number strings give us only hints at what we know or can know. Very good video of a talk by Neuroeconomics researcher Drazen Prelec at MIT. ' ... A pioneer in a “dangerously hot research area ... '. Three cases are studied. Ever wonder what the meaning of time is? A wonderful set of Ted lectures by Sean Carroll on the arrow of time. Mind-bending. Via Delaine Hampton. "... In a nutshell, the Data Singularity is this: humans are being spliced out of the data-driven processes around us, and frequently we aren’t even at the terminal node of action. International cargo shipments, high-frequency stock trades, and genetic diagnoses are all made without us. Absent humans, these data and decision loops have far less friction; they become constrained only by the costs of bandwidth, computation, and storage– all of which are dropping exponentially ... "
Newly discovered company. Note the emphasis on letting experts discover hidden patterns. That's useful, but I think it better to let experts and less-than-expert people with new ideas also work with the data. Not crowd sourcing, but value sourcing. Economist article on the superabundance of data. The value and the complexity it produces. New techniques, hardware and pushing the manipulation of this data down from the high end analysts to the end users is crucial. Prior work on power management reflects recurring themes that can be leveraged to make future systems more energy efficient ... "
In the whimsical four block world: Computers getting cheaper an better. The idea of having a medical testing chip in every home reminds me of a number of ideas floated for a biometric toilet, presented by a number of Japanese firms in the 1990s. We looked at the free social networking service Ning, created by Marc Andreesen. Now it has gone to a pay service, though users can migrate to alternative networks. An instructive example where the free economic model did not work. Walter Riker in Ease of Blogging points to a recent article on using blogs to make a small business grow. He continues to write well on bogging topics. Add it to your feed. Keep it up Walter. The US Library of Congress has announced that it will archive all public tweets. See more in it's blog. To be mine-able, for ever and ever, all your mundane thoughts. I had been starting to think that Twitter's attraction was that it was all throw-away. Maybe not.
" ... That’s right. Every public tweet, ever, since Twitter’s inception in March 2006, will be archived digitally at the Library of Congress. That’s a LOT of tweets, by the way: Twitter processes more than 50 million tweets every day, with the total numbering in the billions ... "
Update and repost: I received quite a few emails regarding this message, and it has seen lots of other comment on the Web. It is good to also mention the Internet Archive Wayback Machine, which does a similar thing for the whole Web. I have used it for several research topics and it is worth understanding as to it's contribution to the permanency of the Internet record. Writing parallel programs to take advantage of new multicore processors is seen as a very esoteric thing. Jeff Todd of Wolfram Research just sent me a more information about how it can be done with Mathematica 7. In particular I like their mention of higher speed simulation, which can be used for predictive analyses. Note also the ability to scale up to more processors. See their video which supplies examples.
" ... Saffron's launch of Tweetdive, an open-source demo app showing how associative memory technology works. Interestingly, TweetDive uses the world of live Twitter feeds as a data source, and illustrates how the "Experience" (memories) in the data can establish connections, analogies and trends fromTweets about a given subject area ... "
Nice visuals in Flowingdata on traffic. Not so much about analysis, but about what the flow of traffic looks like. 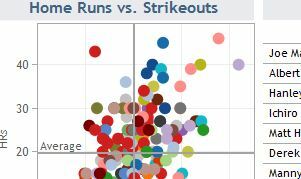 Augmenting data with color can make insight jump out at you. Inspirational for doing better visuals and allowing people to interact with them. New ways to publish buzz. Have now been using Buzz since its launch. Have been pushing these blog posts and Tweets to it. Works fine among my Google mail correspondents, some of them see my communications show up and they read them. What does not seem to happen is any additional enlargement of the conversation space. That happens via search on Twitter or in blogs. Does not seem to happen in Buzz. Why? "We have a new product that is more of an online media product. It lets the operator of a big website insert interactive data visualizations all over the place. The visualizations drive web traffic and dwell time and other online business goals. It’s all hosted by us. It’s sold as a subscription. Here is an example of major customer (CBS Sports) using the product: It’s delivering fantastic results for their web properties, which are big business for them ... "
' ... TC is a new concept in viewing statistics and trends in an animated way by displaying in one chart 5 axis (X, Y, Time, Bubble size & Bubble color) instead of just the traditional X and Y axis. It could be used in analysis, research, presentation etc. In the banking sector, we have Deutsche Bank New York as our client ... '. Demonstrated at the Kno.e.sis Center at Wright State University today: Twitris, a semantic technology based social signal analysis system, where you can Twitter through space, theme and time. Video overview here. Some clever aspects to the analysis. I was only able to get it to work well in Firefox. In ACM News: simulating the evacuation of 70,000 avatars from an e-stadium. We did a number of projects that deal with the simulation of shoppers in a store, so these projects are always of interest. I would like to see how much different the results of a model like this are from classic queuing approaches. I was reminded of Google Map Maker by this post. A means for users to share more about their part of the world. It appears to continue to prosper, with many new countries added. They now have 160 edited regions. Worth a look. Evan Schuman, of StorefrontBackTalk, overviews the PayPal IPhone App, now with over one million downloads. Webinar from Quofore on April 13, 2010 at 11AM EST: More information and registration. An interview with Stanford Prof Byron Reeves of Seriosity. " ... On Leadership: Stanford professor Byron Reeves on how online multiplayer games like 'World of Warcraft' are creating the next generation of leaders ... ' . See also my first look at his book on the subject: Total Engagement. Currently reading. I recently posted about P&G doing franchising of product oriented processes. Well known products like Tide and Mr Clean. As part of the Procter alumni network I just got a broader document about participation. You can read it here. Includes links to the sites and more information. An interview with long time connection Sundar Kadayam about his very innovative search and knowledge system Zakta. We used some of Sundar's previous systems. Also some useful pointers about startups. Zakta is unique, give it a look and compare it with other knowledge search venues. In the BBC: Proper nouns are now allowed in new versions of the Scrabble board game. Think of the opportunity for product placement! Though how many people play board games any more? Via the always alert correspondent Richard James. An overview of P&G's activities in the world of franchising. Including Mr. Clean car washes and Tide Dry Cleaning. There are some things that terrestrial observers can learn from astrophysics. Even if you are mostly interested in commercial applications. Its an example of how to observe data and use it for models. Most recently NASA has established a stereo observation platform around the sun. " ... 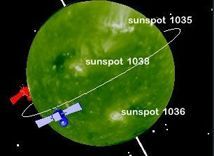 STEREO (Solar TErrestrial RElations Observatory) is the third mission in NASA's Solar Terrestrial Probes program (STP). This two-year mission, launched October 2006, will provide a unique and revolutionary view of the Sun-Earth System. The two nearly identical observatories - one ahead of Earth in its orbit, the other trailing behind - will trace the flow of energy and matter from the Sun to Earth. They will reveal the 3D structure of coronal mass ejections; violent eruptions of matter from the sun that can disrupt satellites and power grids, and help us understand why they happen...." . I now have their system on my IPhone and their data is fed to me. A metaphorical example, at the very least, of how to feed very complex data to analysts and ultimately to management. Add some predictive analytical methods and you have a full real-time platform for understanding a system. Like the sun, or a supply chain, a manufacturing facility or a retail system. In Forbes, a short article about how a number of companies are using predictive analytics to change the game. I again do not consider this to be very new, we did it for many years, but new software and massive amounts of readily available data make it easier to do now. I agree they should be as simple as possible, but are often patched up affairs to match the expectations of those that believe in them. Clay Shirky does make some good points along the way. Have now seen several fail miserably that were simple but just oversold. In the Noisy Channel: Information Retrieval using a Bayesian Model of Learning and Generalization. Well written, good piece with many instructional background links. Have long been interested in the methods of Bayesian reasoning and simulation. We experimented with several uses. It has many potential applications, and this one is particularly intriguing. Best of a number of good articles on Business Intelligence from TDWI. I have mentioned a few of these before, here they all in one piece. The download does require registration. In StorefrontBackTalk: Discussion of an Amazon patent that videotapes a shipment box as it is filled and sealed. Then attaching a link to that video clip to the shipment. Aiming to reduce unwarranted product returns. See the full discussion. Overall an interesting concept with broader application. Good overview of social media prediction opportunities, based on the HP social computing lab paper: Predicting the Future with Social Media. Of course a Twitter stream could be manipulated. In the NYT: Theory of Mind and brain scanning, applied to fiction. Literary scholars turn to science. From a friend. I agree this is scary. it is inevitable that as we know more about the functionality of the brain this kind of manipulation will have to be closely watched. See also Transcranial Neural Stimulation (TNS). It is unclear to me if this is a technique in the same realm as described above. In CIOInsight, a good piece on mastering the art of argument. '... Disagreements happen, but respecting all opinions and engaging in argument can lead to innovation and progress, writes Kris Girrell, who offers three suggestions for fostering constructive arguments. "There is no real creativity in agreeing," Girrell writes. "... [I]n healthy, robust disagreement, there is newness and discovery ... ' . Richard James points me to the blog Phil Presents, by Phil Waknell (ex-P&G, ex-HP). Which covers a number of topics, including robotic presentations. He now runs a company called Ideas on Stage. We followed the technology of RFID for a number of years as it applied to retail on shelf and inventory applications. We tested many related ideas in the innovation centers. I still follow this technology and find that the RFID Journal and its news alerts are a good source. Here is their latest news roundup. A look at the meaning of brands in Design Mind.
' ... Once upon a time, Wolfram Alpha tried to charge $50 for its iPhone app while, at the same time, offering a free iPhone-optimized mobile site. Then, the company shut down the mobile site of its "computational knowledge engine" altogether. Now, however, Wolfram is reversing this strategy and is not just bringing back a new and improved version of its mobile site, but the company also just announced that it will reduce the price of its iPhone app to $1.99 on Saturday and will issue a refund to every customer who bought the app at the full price ... ' . I will be likely to try this more often in a mobile format. It would be further useful to connect the mobile app to sensor data in the IPhone. Related to that: Wolfram Alpha Wants to be a Google Maps for Data. Nice idea.